The other day I asked my husband to pick up a bag of quick cooking barley from the grocery store. He came back with a bag of farro. “What’s that?” I asked. My husband replied, “I dunno. Isn’t that barley?” Somehow I wasn’t convinced. So I decided to look it up. As it turns out, farro is quite complicated. It is a type of hulled wheat and so contains gluten like barley and rye. And what is called ‘farro’ is actually 3 grains, not one. Farro medio (or emmer) is what is sold most commonly in the United States. Then there is farro piccolo (einkorn) and farro grande (spelt). Cooked farro can apparently be used in a wide range of dishes, from breakfast cereals to sweet and savory dishes. Since it has a different texture, it can be a good alternative option to give your child apart from the usual rice, pasta, couscous, or oatmeal. The quick cooking farro grains my husband picked up from Trader Joe’s do look like barley grains, just ‘dirtier looking’ as they come with a browner coat. These must be the semi pearled variety, with some of the bran removed, so that the cooking process will be quicker and easier. 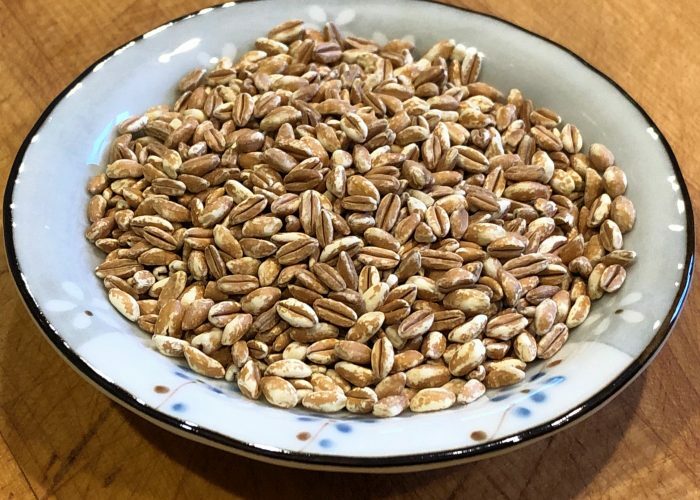 I’ve found that the quick cooking farro actually seemed to cook faster than quick cooking barley, and cooks down to a nice soft slightly chewy texture that older babies and toddlers would find easy to manage. And the taste? Tastes just like barley to me.